9 February 2017 With so many news outlets reporting constantly across multiple platforms from some of the world’s fiercest conflicts, most of us will admit to feeling desensitised to images of war, suffering and abuse. Thankfully, US-Iranian artist Sheida Soleimani has found a new way of opening our eyes. By applying the principles of advertising, Soleimani’s first UK solo show To Oblivion casts fresh light on the female victims of torture in her parents' native Iran. 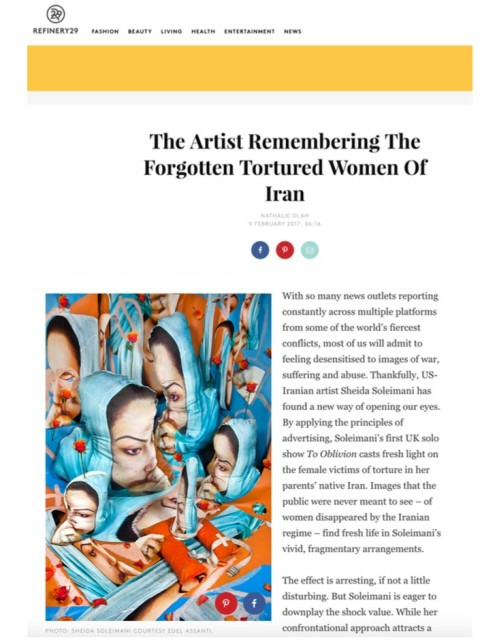 Images that the public were never meant to see – of women disappeared by the Iranian regime – find fresh life in Soleimani’s vivid, fragmentary arrangements. The effect is arresting, if not a little disturbing. But Soleimani is eager to downplay the shock value. While her confrontational approach attracts a growing number of fans, so too does her meticulous research in contacting these women's family members and the human rights lawyers working to bring them justice. Based in Providence, Rhode Island, where she teaches in the faculty of History, Philosophy and Social Sciences at the state’s School for Design, Soleimani applies the same standards of accuracy and ethical rigour as the very best journalist; leading her students by example. We spoke earlier this week, at a strange point in the history of US foreign policy. The previous week, President Trump saw fit to reverse the efforts of his predecessor and stoke US-Iranian tensions, all via Twitter. A few weeks before that, he signed legislature inhibiting women’s access to family-planning assistance in developing and conflict-affected countries around the world. I begin with what seems like the most obvious question. In critiquing aspects of Iranian society, are you worried about stoking the racism and xenophobia that is so rabid in parts of US society at the moment? This is something I think about a lot. The other day I got a message from an Iranian refugee living in Germany asking how I thought I could change things for the better in the US, where successive governments – but this one in particular - have often tried to demonise the Middle East. And it’s a tricky line. But what I’m trying to do with my work, rather than demonise people, is to demonise the government policies that rule over the people and prevent access to basic freedoms. I’m also challenging the impression people have of others based on their image. For instance, we tend to recognise a Muslim woman as someone who wears a head covering, or vice versa. We also view it through the prism of free will. Yet while many women obviously do choose to wear hijab, it’s important to know that it isn’t always a choice. In Iran, for example, it isn’t a choice. You don’t have the rights to your own body. A lot of the women you see in my work were executed or tortured because wearing a head covering wasn’t their choice and didn’t reflect their religious, or secular, views. You’ve mentioned that your parents were persecuted for their secular beliefs. How did they approach talking to you about this? Well, neither of my parents saw a therapist, for want of a better word. So I think I served that role in a way. But it was scary! My mom would tell me nighttime stories describing her prison cell. She would show me the burn marks on her skin from where they tortured her. It wasn’t until school that I realised not everyone had refugee, torture victims for parents. Until recently I had dual citizenship, but it’s been revoked on account of my work. One of the most unexpected things in your work is how glitchy it looks. Why did you choose this aesthetic? People want to be visually seduced. If something is bright and has a contemporary aesthetic, I’m drawn to it, regardless of the content; and product photography and advertising functions in much the same way. I was thinking a lot about that attraction. Because the subject matter I deal with is not attractive. Even though, in our media-saturated world, things like torture have been normalised. So instead of reasserting and normalising that type of violence, I wanted to use the tools of seduction almost as a Trojan horse, to introduce new ways of engaging and thinking about these issues. You’re drawn initially to the colour and composition before realising that the image in fact deals with a torture victim. As for the pixellated element, that is actually a reference to the origins of the work. I receive a lot of images of women who have been erased, via the web and when I blow them up they naturally become pixellated. Rather than gloss over that, I thought it was interesting to consider how these images of women, who were meant to disappear, might permeate and be replicated online. How do you source your images – are they freely available online or do you have to draw on other sources? I’d say 60-70% of my images are ones that I have dug deep on the internet to find, and others I have been able to source by talking to human rights lawyers inside of Iran and family members of these women via the Dark Web, because in Iran, the internet is heavily censored and controlled by the government. Which might come as a shock to anyone who knows me because I’m technologically quite illiterate. I wouldn’t have been able to do it if it weren’t my friend who knew how to set up a proxy. Do you fear any consequences from your work? There are times when I’ve received threats from people. I think I’m maybe hyperconscious and sensitive when I shouldn’t be. But I worry because in the past, and particularly during the revolution when people who were opposed to the government escaped or were exiled and then followed and executed by members of the Basij – the neighbourhood militia. There’s a famous story about a homosexual musician called Fereydoun Farrokhzad who escaped to Germany and it is widely known that his murder was ordered by the Iranian government. So there is a bit of worry. Every time I get an email I question how easy it would be for someone to track down. Do you plan to make work that responds to the current state of US politics? Yes. In fact I’m in the process of doing exactly that right now, looking at this global trend happening with the Brexit vote, the Trump vote and the Colombian Farc vote. There are a lot of crazy things happening and I think it’s a response to economics and trade. So in this next series I’m looking at OPEC (Organisation of the Petroleum Exporting Countries). There’s 14, predominantly Middle Eastern countries that are controlled by Anglo-Saxon forces and a lot of the US political and military involvement in these countries can be explained by looking at the oil industry. So I’m working on a portrait series of these OPEC leaders, who are all men, and of General David Petraeus who led the US invasion of Iraq in 2004. Do you think that greater interrogation of western countries’ colonial past might be one consequence of this current political upheaval? I think so, yes. It takes something of this magnitude for people to start assessing their own history and position on certain issues. We’re seeing a lot of first-time protesters. The women’s march in particular engaged a lot of otherwise apolitical people. Absolutely. One thing that actually scares me, talking to my students, is that a lot of younger women don’t identify as feminists because they think the word is scary or has a negative connotation. But I always say to them, as soon as we stop recognising what the women before us have done, how can we move forward? How have your students responded to your work? My focus in my teaching is on the intersection between politics, art and activism. So we talk about that a lot and they’ve been particularly interested in the question of whether it’s ok to use someone’s image without their permission. And my question is always this: are you profiting from that image or are you using it to draw attention to an issue that is not given enough visibility in the world? And so long as my work falls into the latter category, I’m comfortable with it. I have not spoken to these women because they were executed. They’re dead. But I have spoken to some of their family members who want me to raise awareness of this issue. I’m not profiting from these images. After all, who wants images of tortured people on their wall? But if I do sell anything, I’m committed to giving it [the proceeds] to organisations working on the front line to prevent torture from happening in the future.